Wes Anderson remains one of my favorite working directors. The man just has a certain flare to his films that appeals to me. This first trailer for his latest film "Moonrise Kingdom," is smothered in that particular Anderson flare. See for yourself after the jump. The trailer is everything I could have hoped for our initial peek at Wes Anderson's new film, it sets the table without fail and leaves me eagerly awaiting the Anderson entree to arrive. Everything about this movie has me jumping for joy. Wes Anderson films always house incredible casts and once again Wes has put an exceptional one together including Bill Murray, Jason Schwartzman, Bruce Willis, Edward Norton, Frances McDormand, Tilda Swinton and that doesn't even account for the two kids who runaway together, who I must say look both absolutely hysterical and adorable. Yeah, I'm over-hyping this but its Wes Anderson and I'm allowed to be a little over-excited from time to time. 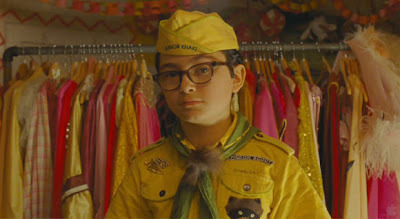 "Moonrise Kingdom" releases May 25th, 2012. With its deadpan dialogue and damaged characters, Moonrise Kingdom casts a unique and charming spell and is surprisingly hopeful.